extend equipment life. 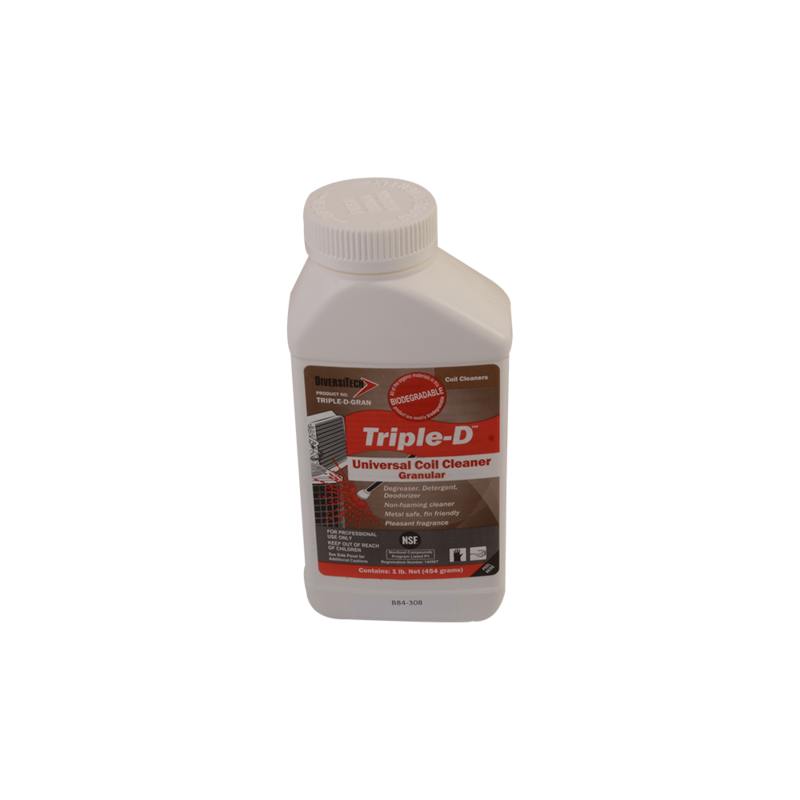 Triple-D® is biodegradable and NSF approved requiring a soak time of five to ten minutes. 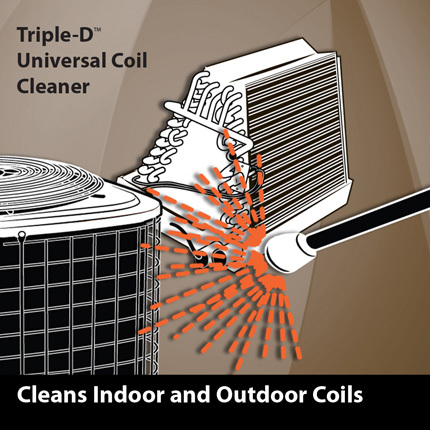 Triple-D® is the ultimate universal coil cleaner that effectively cleans condensers, evaporators, micro-channels, rubber roofs, and mini-split applications. The triple active synergistic detergent is formulated to remove a broad range of soils while degreasing and deodorizing. It is ideal for cleaning most metals including aluminum and copper while extending equipment life and diminishing the potential for refrigerant leaks. This is prevalent now more than ever with R410A systems. Using 75% less than comparable products, it reduces the amount of solution needed to clean. 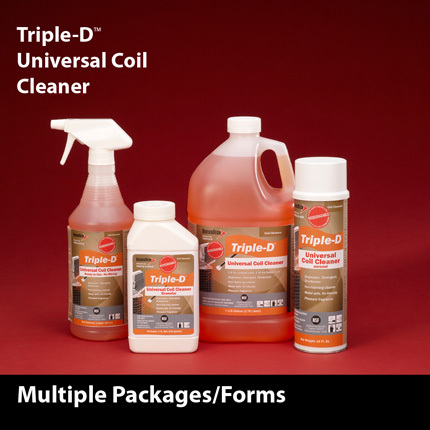 Triple-D® is availabe as a concentrated liquid, pre-diluted ready-to-use liquid, aerosol, and granular coil cleaner. Same product with many packaging solutions available. The unique inhibitor of Triple-D® prevents the attack of aluminum coil components. This is more critical than ever with systems designed for R410A refrigerant. Conventional foaming acid coil cleaners actually attack and chemically react with the aluminum coil components, which is exhibited by a foaming action. The aluminum dissolves, destroying the heat transfer ability of the coil, creating the potential for refrigerant leaks. 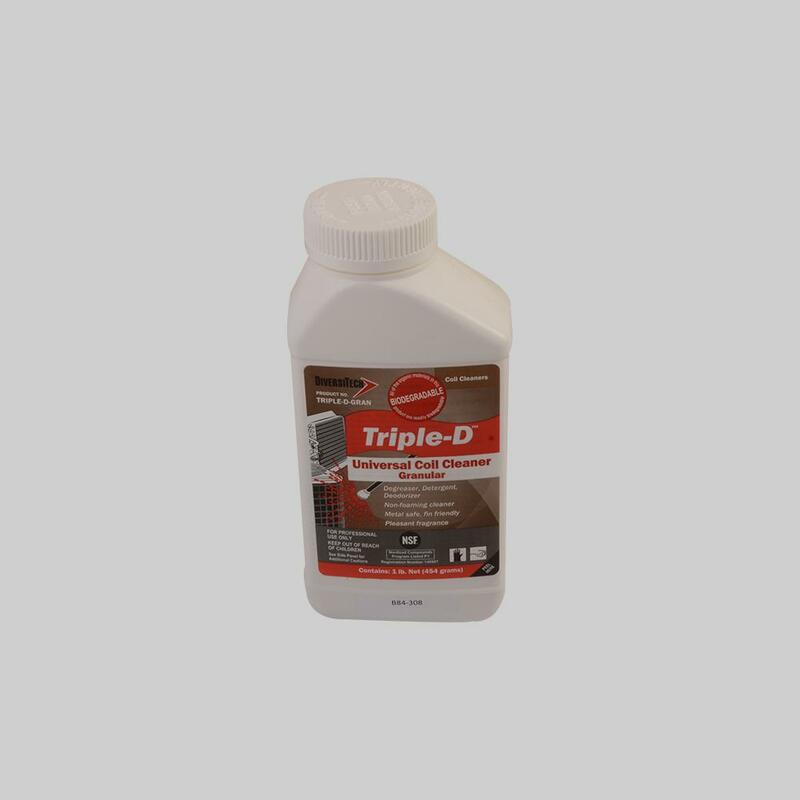 The specially engineered characteristics of Triple-D prevents corrosion and is non-foaming. This makes Triple-D the ideal cleaner for micro-channel coils and other sensitive equipment. 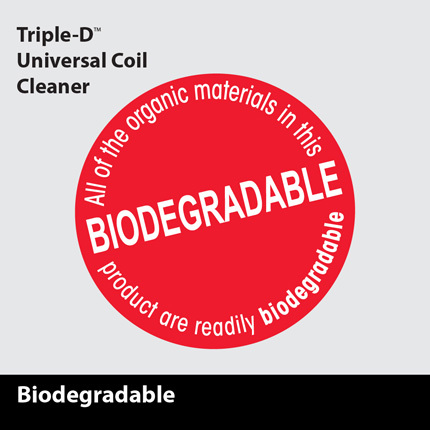 Triple-D® is manufactured from chemicals that break down naturally in the environment. When a coil is cleaned, the rinse water is typically washed into the storm water. 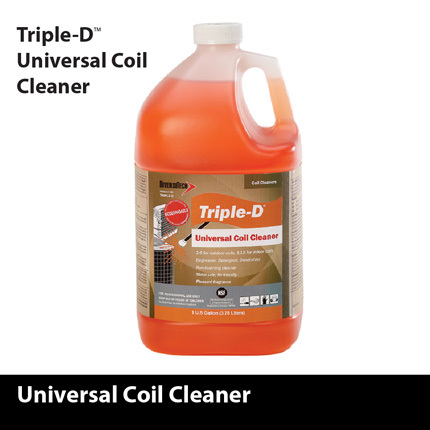 Triple-D® has a lower cost per mixed gallon against most coil cleaners. With a 6:1 dilution ratio, Triple-D has 7 gallons of usable product per gallon of concentrate. Triple-D® is all you need for most applications. 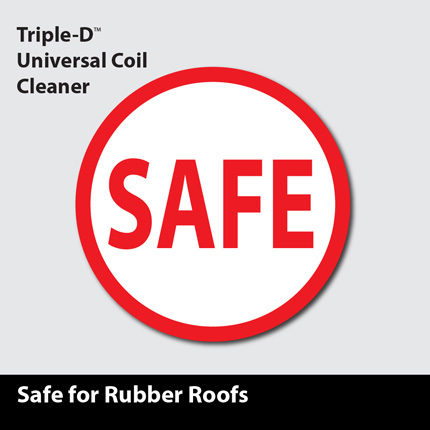 By providing a one product solutlion for iindoor and outdoor coils plus engineered and rubber roofs, using Triple-D will reduce your inventory and eliminates the potential risk of using the wrong type of product on a system. 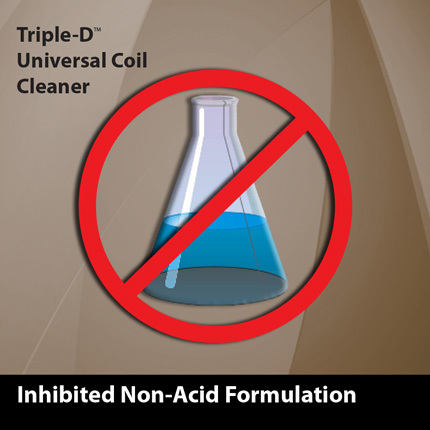 Triple-D® contains a unique inhibitor that allows for a very strong non-acid formulation that effectively cleans coils. 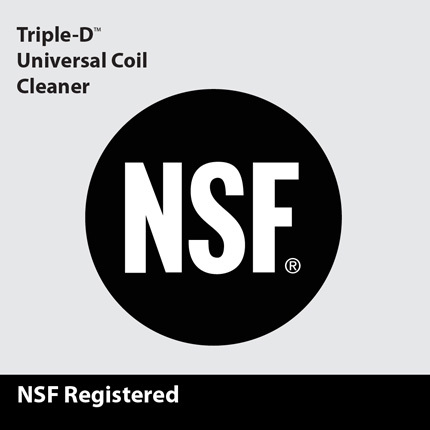 Triple-D® is NSF approved for facilities that requires designation. Triple-D® is compatible with engineered polymeric and rubber roofing. 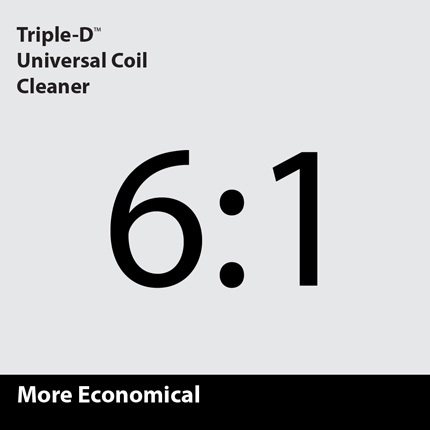 Triple-D® is a universal solution for condensers and evaporators. For evaporators, using 1:20 water/concentrate mix ratio also provides a no-rinse solution.